What does the future hold for the Daily Telegraph? 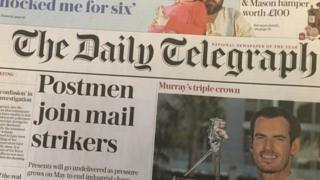 Who would want to buy the Daily Telegraph? This is a question I have heard constantly through 2016, as repeated rumours circulate about its possible sale. The smarter question is - who wouldn't? However endless the turmoil of newspapers, the Telegraph remains an ornament to Britain and one of the world's great titles. Despite recent controversies and cutbacks that have reduced staffing to levels unimaginable in Lord Hartwell's day, it is in decent health editorially and in excellent health commercially. At its best, the daily and Sunday papers channel the kind of sceptical conservatism that speaks to and for a patriotic and provincial England. The best British newspaper story since the turn of the century remains the paper's expenses scandal. And in 2016 alone, perhaps the two biggest newspaper scoops were Telegraph ones - the sting on England football manager Sam Allardyce, which led to his resignation, and Charles Moore's stunning revelation about the Archbishop of Canterbury's real father. Recent Audit Bureau of Circulation figures suggest the circulation of the daily paper stands at 455,438, of which 20,801 are bulk sales - copies given away to hotels, railway stations etc - ahead of The Times, which is on 442,670, of which 76,020 are bulks. Times editor John Witherow has made no secret of his desire to take readers from the Telegraph, hoping (together with digital subscriptions) to surpass its readership. His signing of football writer Henry Winter should be seen in this context. The Telegraph is down 5.26% year on year. The Times is up 8.61%. Nevertheless, the Telegraph circulation is relatively robust, with a large and committed subscriber base. The paper's website is navigable and clear. In November, telegraph.co.uk achieved 4,915,465 daily unique browsers, in what has been a great year for traffic, thanks largely to Brexit, the Olympics and Donald Trump. There have been several editors in recent years, and for a while there was uncertainty around the role and the strategy of now-departed Jason Seiken, an American executive. Accusations of commercial influence over editorial policy by political writer Peter Oborne were strenuously denied. One member of staff described the mood to me this week as "business as usual" but emphasised the place retains editorial ambition: "If you have a good idea, they'll back you." Others say the constant stream of departures, a familiar fact of modern newspapers, has created gloom and despondency. Wealthy businessmen Sir David and Sir Frederick Barclay bought the Telegraph for £665m in 2004. It reported an operating profit of £48.3m, on turnover of £314.6m, for 2015. Murdoch MacLennan, chief executive of Telegraph Media Group, is under intense pressure to sustain such profitability. Structural changes in the industry - shrinking circulations, a declining print advertising market, and higher paper costs because of the weak pound following Brexit - will exacerbate this pressure. But why would the reclusive Barclays, who are worth several billion, sell a paper of influence that generates nearly £50m? Why would anyone? People sell profitable businesses for all sorts of reasons - boredom, satisfaction that they've recouped their initial investment, a feeling that they could secure a good price, the need for cash. And many others. In September it was revealed that Press Acquisitions Limited, the parent company of the Telegraph, took a £150m writedown - a sure sign, many in the industry concluded, that a sale was imminent. Yet, as they have done for months, the Barclays deny that they have any intention of selling. A spokesman repeated a familiar line: "There are no plans to sell Telegraph Media Group or any part of it and there never have been." I asked the same spokesman if Arron Banks, the UKIP donor with political ambitions, had been in discussion with the Barclays about a consortium to buy it off them but there was no comment. Rumours have circulated around the industry for many weeks about Banks's supposed interest. He was pictured with the Barclays recently at their party celebrating Nigel Farage and Brexit at the Ritz Hotel in London. Through a spokesman, Banks declined to be interviewed for this article. I understand that he has never met or spoken to Aidan Barclay, the son of Sir David, who is chairman of Telegraph Media Group. Aidan didn't attend the Ritz party. Through a spokesman, Banks offered no comment when asked whether he was interested in buying the Telegraph, and indeed whether he was in America with one of the younger Barclays recently. Were Banks to pursue his consortium, he wouldn't be short of wealthy friends with shared political ambitions: Malcolm Pearson (former UKIP party leader), David Stevens, and Stuart Wheeler are among the UKIP donors who have made considerable wealth in the private sector. I am told that Banks has discussed buying the Telegraph with friends in the political world in recent weeks. Image caption Might Evgeny Lebedev be interested? Another potential buyer of the Telegraph is Evgeny Lebedev, owner of the Independent and London Evening Standard but, like Banks, he would have to raise a lot of money. Lebedev has turned the Independent around financially in the past six years (full disclosure here: during nearly three of them I was his editor). It is now profitable, with a valuation that is rising steeply. Yet after paying closure costs when the print Independent shut in March, following the sale of sister paper i to Johnston Press, his net income from that deal is a fraction of what the Barclays would now want for the Telegraph. Lebedev certainly has ambitions to expand his business by acquiring another title, a point he discussed with Aidan over lunch at the Ritz earlier this year. I understand he is confident of obtaining the financial backing he needs, but not currently in dialogue with the Barclays. Other owners currently in the UK market seem unlikely purchasers. Richard Desmond would sell the Daily Express for the right price, which suggests his commercial priorities don't lie in print. For Jonathan Rothermere at the Daily Mail and General Trust, the future growth targeted by his new chief executive, university friend and former Boston Consulting Group veteran Paul Zwillenberg, is mainly non-print and overseas. So perhaps the likeliest buyer of the Telegraph, if someone such as Banks can't raise the necessary funds, is an overseas investor. Yes, the Barclays insist they have no intention to sell; but based on over a dozen conversations with well-placed sources in and around the industry over the past fortnight, they won't be short of offers in 2017.